Who hasn’t imagined themselves part of a world more exiting, more colourful, more sensual, or perhaps, more dangerous than their own? 1930s Australia is a bland and conservative place, subdued by economic depression, isolation and censorship. For an adolescent Lilly, becoming friends with Eva is like glimpsing the colourful spectrum of ordinary light as it passes through a shard of broken glass. Eva is the middle daughter of Helena and Evan Trentham. He is a well-known avant-garde painter; she has a glamour that rebels against the restraint of the times and separates her from the other mothers, who dote earnestly on their children and keep tidy hours and tidy homes. The Trentham home is old and expansive; the architecture of the house, and the people within it, is ramshackle. But inside and out Helena cultivates a kind of unrestrained beauty; bringing artists together with the same eye that nurtures wild growth in her garden. Lilly is drawn into the life of the Trentham’s like a stray is drawn towards food. She skulks on the edge of that life, observing, but unobserved. She collects the crumbs of hedonistic abandon: moments of attention; fragments of knowledge; discussions and behaviours found nowhere in the beige confines of her parents’ home. The neglect of the Trentham daughters is extended to her, and as their large house fills with more and more strays, Lilly becomes witness to the emergence of Australia’s Modern Art Movement and its most notorious actors and scandals. 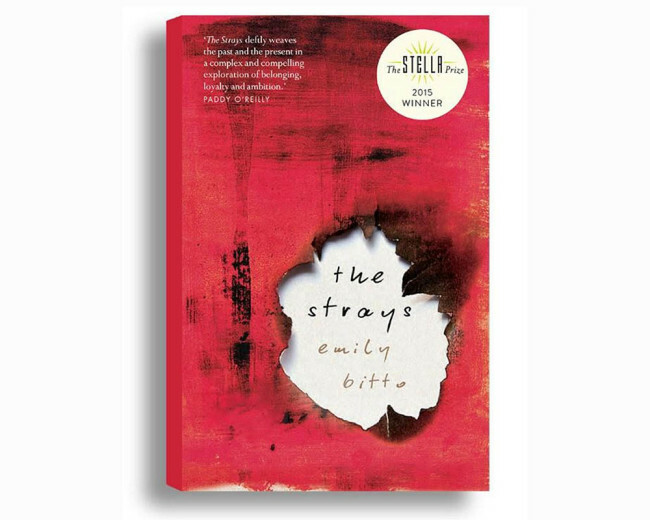 Emily Bitto has written beautifully and convincingly – I had to double check the Trenthams did not actually exist because Bitto’s portrayal of their life seems familiar. In particular, I couldn’t help wondering about the lives of children living on the periphery of the Heide circle in the 1940s. This is not their story, but it might have been. What is born of an uncompromising commitment to a life of art? The Strays asks this question over and over, and the answer swings between light and shade; between vibrant beauty and hidden rot. Bitto uses metaphor to great effect. When describing Helena’s miniature paintings she writes, “She had put them in places where they were vulnerable to damage … They were neglected, mishandled, exposed to the elements. But this did not lessen their impact. They contained the strength of weather within them.” This passage could be about Helena’s approach to her children as much as her art. Like the paintings, Eva and her sisters are marked and sculpted by exposure and neglect. Lilly, too, is windswept by her time in the household. Lilly is so recognisable in her longing to be part of the Trentham Family, and also in her moments of reluctance, when risk is perceived and her conventional upbringing shows its hand. But she is not one of them. In her words she “was a cuckoo in the nest, an imposter who listened and observed, hording and collecting.” When the time comes, she is returned from whence she came. This book was so satisfying in its rendering of the complexity of a life lived for creativity, and the inherent potential and hazards of that life. I do not know, even now, who should be held responsible for which outcomes. The Trentham’s life, like Helena’s garden, was full of creative chaos and colour brought about by a rejection of convention and a certain amount of neglect. But, as any gardener knows, neglect can promote growth, or retard it. It depends entirely on the nature of the organism.